9 Royal Victoria Court is situated on the first floor of a large Georgian house. A short stroll from the pretty harbour and beach and within easy walking distance (approximately 300 metres) of Tenby's three other beautiful beaches. High speed Broadband. Communal stairs or the lift lead up to this modern apartment which has been finished to a high 4 star standard and has many of the modern conveniences of home and a pleasant retreat to relax in after a busy day exploring Pembrokeshire. Located at the top of Crackwell Street just yards from the centre of town with its variety of shops restaurants, cafes, pubs and wine bars. Rent inclusive of electricity and central heating. Duvets, bed linen and towels provided. PLEASE NOTE - No Smoking. No Pets. Monday & Friday Changeover. 3pm Takeover. 10am Checkout. Due to our central location within the historic town walls there is no parking outside the apartment (drop off only) and during the high season (July and August) there is restricted access due to pedestrianisation between the hours of 9.30 am and 5.30 pm. However there are a number of car parks nearby the nearest being 400 metres or a 5 minute short walk within the town. Full-sized oven and fridge with freezer compartment. Free Fibre Optic Broadband, Flat screen TV and DVD player. If you’re not down on the huge, beautiful, soft-sandy beaches, Tenby has many other attractions, including daily (weather permitting) boat trips to the Monastic Caldey Island, or to fish or see other wildlife. Or maybe you fancy the climbing walls at the Overhang, on the slipway to Castle Beach? Tenby is well set within the Pembrokeshire National Park and offers a great base for exploring this beautiful coast and county, with its many leisure pursuits and attractions. You can visit the nearby attractions such as Manor House Wildlife Park (meerkats, Sumatran Tigers and all the rest) Folly Farm (Zoo, vintage funfair and loads of other activities), Heatherton (many children’s and adult activities, from excellent crazy golf, through water-zorbing and tree-top experiences, to archery, boating and driving activities for all ages). Or there is the theme park at Oakwood, if you really can’t bear another day just relaxing on the beaches and eating fresh-off-the-boat fish at one of Tenby’s many fine eating places, such as The Plantagenet, The Qube, The Stables, The Mooring or The Blue Ball. For a more sedate experience, castles at nearby Carew, Pembroke and Laugharne (Dylan Thomas’ home) are always well worth a visit, and offer many events. You must visit St David’s, with it’s historic cathedral. Tenby is on the Pembrokeshire Coastal Path so there’s plenty of wonderful coastal walking to be done in both directions. Further details can be given on application. We are a couple of a certain age, 2 grown up children and 3 grandchildren. We grew up in South Wales and currently live 8 miles from the Brecon Beacons National Park. We have holidayed in West Wales for over 30 years, as a young family and now we enjoy the relaxation and beautiful scenery of the coastal path walks. We both have full-time occupations. A trip to Tenby has always been a seaside joy. It's mixture of old-fashioned charm and modern facilities provide both us and now our grandchildren with all that we need for a great holiday break. 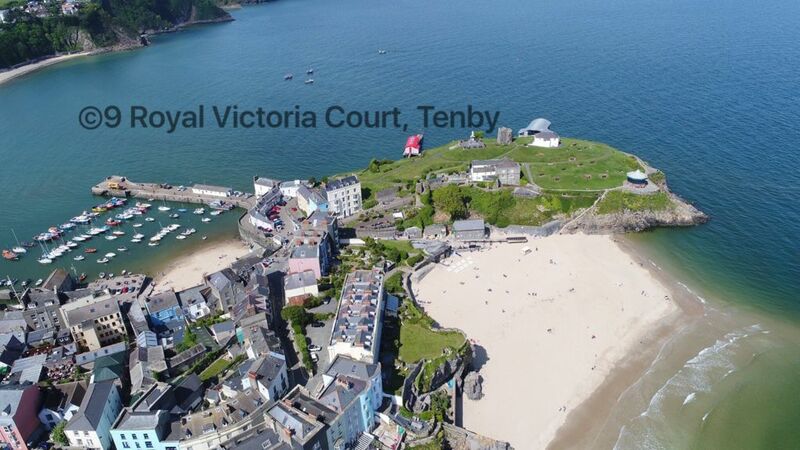 Royal Victoria Court is classic Tenby - a lovely building in the heart of Tenby Wall. The picturesque beaches are a delight and you are never more than a few steps away from the bustling restaurants and cafes in the town. The apartment is in the best part of town near the best coffee shop, restaurants and shops and and just outside your door is the Waterfront You will not need a vehicle, all amenities within walking distance and public transport available to travel further afield. Newly renovated Bathroom, bath/shower over, basin, WC. Electric heating throughout included in price. Free on street and Pay and Display Car Parking within easy walking distance (300metres) within the town. Bath, hand and kitchen towels provided. Notes on accommodation: Central heating consists of economy 7 heater and electric wall mounted convector heaters. Bath, Hand and Kitchen Towels / Linen / Maid service: Duvets and bed linen provided. The property is in an excellent location and the flat is decorated to a high standard and was very clean. Would definataly return. Thank you very much for the nice comments. We hope you enjoyed the New Year Celebrations as much as we usually do. We will welcome your return one day. We are pleased you enjoyed your stay and thank you for your thoughts and ideas We will consider these comments in future plans for provision of the additional fixtures for future guests. Town centre location ideal for beaches and restaurants. Flat has all amenities needed. Clean and tidy. Very pleased you enjoyed our apartment within the Historic Town Walls. Thank you for the kind comments. We parked the car in the car park (£4 for 24 hours)and followed the very clear instructions to access the apartment.There were only two of us so the apartment felt roomy. It is located very near to the harbour, shops and beaches and suited us as we have limited mobility. Tenby is a lovely town and we took a boat ride to Caldy Island and also went to St Davids (an hour away). Altogether a lovely holiday. Lovely flat. Had everything we needed for our stay. Close to beach & town centre. Will definetly stay here again. We enjoyed our first family holiday with our 7month old baby at this property last week and it was absolutely perfect. I am a little particular when it comes to accommodation, and am very rarely pleased, but the standard of cleanliness and decor were outstanding. All of the utensils, crockey,pots,pans etc were spotless and everything we could need was provided. The location was ideal, a few minutes walk from all beaches, the harbour, shops and restaurants. We felt very at home and can't wait to return! Perfect holiday! 200 meters to South and North beach. Local shops, restaurants, supermarkets, banks are within 200 meters. Booking Notes: A 30% deposit payable immediately is required to reserve the booking. The remaining balance is to be paid in full 8 weeks prior to holiday commencement. All payments are non refundable. Changeover Day: Changeover day for weekly breaks is a Friday. Check in 3pm. Check out 10am.